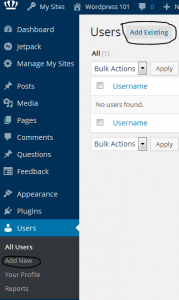 The role you assign a user is based on how much access you want them to have to a site. 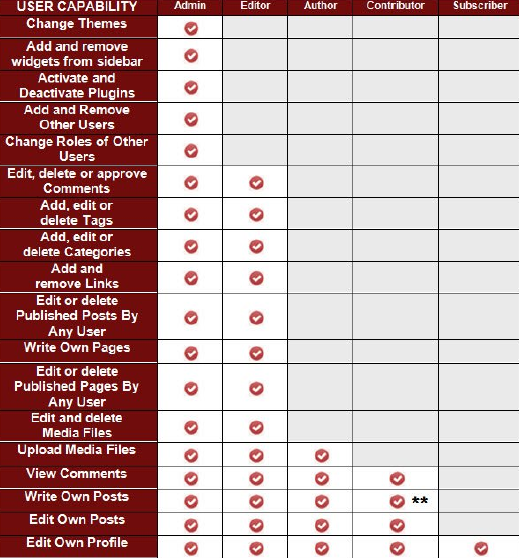 The Administrator has the highest access of the site users and is able to use all enabled site features, while a subscriber has the lowest, only able to read and write comments (for more information check out the comparison charts below). You can have more than one Administrator on any given site and all have equal ability to fully manage the site. Editor – can edit, upload, and remove all posts, images, links, comments, etc. Now that you know what the different roles are and what they can do you are ready to add people to your site. 1. Click on the tab on the dashboard labeled “Users” then “Add New” from the menu that appears below it, alternatively you can also select “Add Existing” from the top of the Users page or hover over “New” then select “User” from the admin bar. 2. Type in the odu email address of the person you wish to add. 4. Have the person go to their email and click the link sent to them for confirmation (there will also be a link to the site itself, clicking that will not grant the new user access).